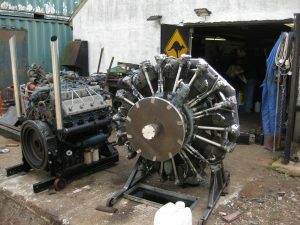 The Russian Ash-62 aero engine is a single bank supercharged 9 cylinder radial of 30 litres displacement. Originally designed in the 1920’s by the Wright Corporation as the Wright Cyclone, it was used in many well known WW2 American aircraft including the B17 Flying Fortress and the Dakota DC3. After the war the design was licenced to the USSR where the engine was further developed into the Ash62 and used to power the worlds largest single engine biplane, the Antonov AN2. 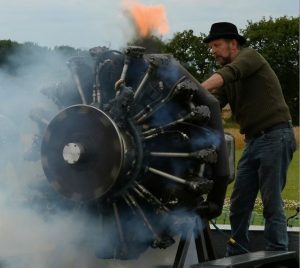 Noise, Smoke & Fire – Ground running an Ash-62 radial engine. My engine is ‘core run out’, meaning it’s exceeded it’s allowed 5,000 flying hours. (i.e. it’s knackered but still runs). These can sometimes be found at little more than scrap value but usually minus some of the ancillaries like the starter and carburetor. Ground running one of these beasts is in theory simple, strap it to a substantial mounting , connect an oil tank, a petrol tank and a couple of batteries for the starter, hit the start button and … frighten yourself stupid. In practice it’s a little more complicated but not difficult. Aero engines are designed to achieve high hours of reliable use in a specific environment and duty cycle :- warm up, max power take-off, sustained high power cruise and shutdown. Static ground running is a very different circumstance, low hours, no load running, frequent short runs and long storage periods. This greatly simplifies the support systems required but requires several other factors to be taken into consideration. Supporting the engine weight (700kg) is the main design criteria, vibration and torque reaction less so (assuming a well balanced cutdown prop or moderate flywheel is used). Radials have rear mounts so there is a large bending moment on the mounts to be taken into consideration. I fabricated a well braced stand of 50mm box steel with 5mm wall. Ordinary unleaded ‘pump’ petrol is fine for ground running, the engine uses around a litre a minute. It’s good not to have too large a tank for safety reasons, 10 to 20 litres and top it up before each run. A fuel shutoff tap on the bottom of the tank is essential and a 2nd drain tap is useful. I mount the tank low for ease of filling and use the fuel pump on the engine to feed the carb. A primer bulb from an outboard boat engine in the fuel line is used to initially fill the carb float chamber (holds about a litre) and top up prior to each engine start. The choke is not needed for starting, just 30cc of petrol poured directly into the carb immediately before cranking the engine gives an instant reliable startup . Like most aero engines, the Ash62 is dry sump and uses an external reservoir tank. I use a 20 litre tank maintained around 2/3 full with any cheap motor oil I can get. 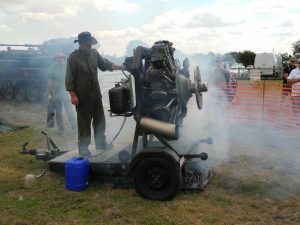 Worn out radial engines burn and leak a lot of oil, especially when ground run at shows with perhaps 5 to 10 cold starts a day so regular level checks and top-ups are necessary. The bottom of the tank must be above the oil pump level with a down slope of the feed pipe to prevent air traps. The tank needs to be either drained or have a shut off valve in the feed pipe to prevent draining down into the engine if left standing for more the 24hrs. This was only discovered after much frustration with the engine oiling up heavily and burning vast amounts of oil. The crankcase breather must be returned to the top of the oil tank, the tank cap must seal with only a small vent hole (3mm) and the oil lines must not collapse under heat and vacuum. The reason; On the Ash62 the centrifugal supercharger is coaxial mounted on the crankshaft and runs on a pressure fed plain sleeve bearing at 10 times engine speed. With no load on the engine, the throttles are never opened more than 10%, thus the supercharger never reaches boost pressure and is under considerable vacuum, if the crank case is vented to atmospheric pressure lots of oil will be sucked through the sleeve bearing into the supercharger housing. Closing the whole lubrication system with just a very small vent will prevent this. (this is also as shown in the Russian engine installation manual). Radial engines do not like running without some sort of flywheel (or prop). Tick over (idling) will be rough and with considerable torsional vibration, The starter will have a very hard time and the throttle response is ‘twitchy’ (like a race engine). I use a 500mm diameter, 30mm steel disk (50kg). No cooling is required if the engine is run ‘no load’ and runs are of limited duration (less than 5 minutes). I have removed all the cylinder shrouds to allow some natural convection (and looks better) . Periodically the head temperature is checked (simple touch test). The starter is 24volt and draws around 100 amps so 2 car batteries is series works well. A 100amp relay is used to switch the current with a simple momentary action toggle switch. The Ash-62 uses an inertial starter – a small heavy flywheel is spun up to over 5,000 rpm (takes about 30 seconds) then a simple solenoid operated dog clutch operated by a 2nd momentary toggle switch engages the flywheel to the crankshaft via a 133:1 reduction gear. This gives a few rotations to fire the engine before the flywheel must be wound up again. A ‘buzz coil’ HT feed is available on the RH mag but this has not been found to be necessary. The two magneto kill wires are grounded via two toggle switches to stop the engine. This needs to be disabled to prevent oil pumping out the propeller shaft. Simply remove the drive quill from the pump and make a blanking gasket to cover the oil intake hole on the pump. 2. remove the 4 front lower spark plugs and drain any oil, I usually get a large mug full out of either cylinder 4 or 5. 3. drain the sump ( 1 to 2 litres) and the lower inlet manifolds. 4. with the 4 plugs still out and the mags off, turn the engine over 3 or 4 times by hand or on the starter. 5. refit the plugs and manifold drains. 1. check oil and fuel levels are ok and turn the fuel tap on. 2. operate fuel primer until back pressure is felt (40 to 50 squeezes if the carb is dry). 3. with the mags OFF, turn the engine over slowly on the starter to be certain it hasn’t hydraulic locked. 4. switch the mags ON and power up the starter. 6. Close the throttle and hold it closed. 7. Engage the dog clutch solenoid – the engine should fire immediately. 8. Warm the engine gently on fast tickover for a couple of minutes before you play with throttle. 9. Keep an eye on the cylinder head temperature, the oil temperature and pressure. Never exceed 2,000 rpm. 1. Allow the engine to run at idle for a while prior to shut down to scavenge the oil and cool gently. 2. Switch the mag switches to OFF then catch any fuel from the supercharger drain. 1. shut the engine down by closing the fuel tap to run the carb dry. 2. drain the fuel tank, the oil tank and the sump. check the oil for metal particles. Big engines can be dangerous if run carelessly. Always have an assistant with a CO2 fire extinguisher standing behind you, there’s a lot of petrol around and carb fires are common, a remote kill switch is a good idea. A safety fence and public liability insurance are mandatory at shows. It’s also a good idea to wear ear defenders and goggles, especially if you run a prop. There is a huge amount of carbon monoxide in the exhaust, never run the engine in a confined space. Have plenty of rags and drip trays handy, old radial engines can be very oily and dirty.